Created for lovers of gourmet cooking at home, the new Tefal Heritage Triply range is elegant French-designed cookware at its best. Featuring three layers of stainless steel and aluminium metals bonded together, the triply cookware technology in the Tefal Heritage range offers perfectly even heat distribution. 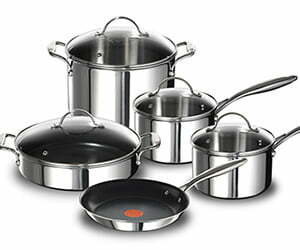 The new range contains nine pieces including three fry pans, a grill pan, a stir fry piece, a sautepan, a stewpot, a pot roast and a five-piece set. Six products from the range feature Tefal’s famous non-stick coating and the unique Tefal ‘Thermo Spot’. The ‘Thermo Spot’ helps identify when the pan is at 180 degrees – the perfect temperature to start cooking. The entire Heritage Triply coated range features the revolutionary seven layer non-stick coating, Titanium, for exceptional cooking performance, durability, ease of food release and cleaning. So durable, even metal utensils are safe to use. To enter in the draw to win the new Tefal Heritage Triply Range valued at over $600, simply sign up to the RESCU newsletter by filling in the form to your left. By entering this competition, you are agreeing to sign up to the RESCU daily newsletter. Click here to view the full terms and conditions.